The Indian Institute of Management Amritsar conducted the second edition of its annual HR Conclave, ‘Yukti’ on 19th August 2017 with flying colors. The topic for the conclave was ‘Redefining Workplace’, under which two subtopics viz. Avenue of Engagement and Integrating Diversity at Workplace were discussed. The event was marked by the presence of stellar industry stalwarts. The panel was divided into two slots. The first Panel included Dr. Ritu Anand (Senior Vice President and the Deputy Head – Global HR at Tata Consultancy Services), Mr. A.K. Munjal (Vice President –HR, Maruti Suzuki India Ltd), Dr. V.P.Singh (Advisor, Organization Development, Patanjali Ayurved Limited), Mr. Deepak Bharara (Chief Human Resource Officer, Lanco Infratech Ltd), Ms. Dnyan Shah (Senior VP Business HR Head, Mphasis Ltd), and Mr. Vijay Bhaskar (Head- Process Control, LifeSpring Hospitals Private Limited). After the auspicious lamp lightening ceremony embarked by all our honorable guests, the opening address for Yukti 2017 was delivered by respected Professor Geetha M. who welcomed and thanked all the dignitaries of Panel one to mark their presence at IIM Amritsar. The topic of discussion for the first panel was “Redefining Workplaces: Avenue of Engagement”. Following the inaugural address, two of the groups from IIM Amritsar showcased their presentations backed by real time sampling data and various dimensions to Workplace viz. Well Being, Engagement, Innovation, Diversity, Inclusion, Flexibility and Inspiration. The first panel was then moderated by Mr. V.P. Singh who raised the questions and invited each dignitary to address the issue. The speakers illuminated the audience about the differences in the meanings of Bonds and Engagements and put up their perspective. Each panel described the ways the concept of engagement has evolved, the challenges with the scaling up and down the engagements at different levels in different industries, the success stories of the companies and the ways they embraced engagement, the correlation of engagement with the business outcome, and the role of engagement in 75 year old India, in 2022, where data will be the oil and people will be the engine. The panel questioned within themselves to find the answers to above questions and also addressed the questions of the students. The discussion also touted Engagement with Responsibility and in turn with Pride that an employee takes with his association with a cause or with the organization as a whole. It also described the Employee Customer Relationship, the role of innovation with engagement. Phase one ended with a lot of key takeaways like – Engagement is following passion with confidence to pursue it, inverting the organization and letting the front-liners throw challenges to management to solve the complex equation of Engagement, emotionally investing in people, learning to be unhappy with the status quo, visualizing within oneself the belief and ultimately connecting with oneself. The entire discussion was then summarized by PGP02 student Saheb Sethi after which the panel members were felicitated. The second Panel included Meenalochani Kumar (Senior Director and Global Design Lead- Leadership and Executive Development at Sutherland Global), Ms. Shilpi Saxena (Head of HR and L&D, Kurlon Ltd), Mr. Prem Singh (President – Global HR, Wockhardt Limited), Mr. Vijay Deshpande (Vice President and Head Human Resources JK Tyre and Industries Limited), Mr. Raja Reddy (Head of Marketing, Servier). The topic of discussion for the second panel was “Integrating Diversity at Workplace”. Similar to the fist panel, two of the groups from IIM Amritsar showcased their presentations backed by extensive research and comprehensive analysis. After the welcome, the panel moderated by Mr. Raja Reddy discussed the topic one by one and expounded the significance of Diversity in the Workplace, which is a melting pot of different cultures. Also, closely intertwined terms like Inclusion, Diversity and Equality were explained, differentiated and finally put forward as the drivers for the growth of the organization. The Panel also discussed on enhancing the diversity, at different levels and how it cannot be ignored. Speakers have identified the various problems regarding Diversity – the problems the companies face while managing people from diverse cultures. Significant points regarding the significance of diversity management were raised by the Panel during their discussion. Points regarding respecting the differences, promoting homogeneity among individuals, valuing individual perspectives were made. In their address to the students, the Panel also discussed the costs regarding diversity and the overall benefits regarding Inclusion of the diversity and equality have been compared. Also, different ways to promote diversity with the help of innovation like aiming at social collaborations, team-based activities and decentralized peer to peer learning etc. have been weighted. The closing ceremony speech was undertaken by PGP02 student Saikiran, who summarized the points made and gave a word of thanks after which the panel members were felicitated. 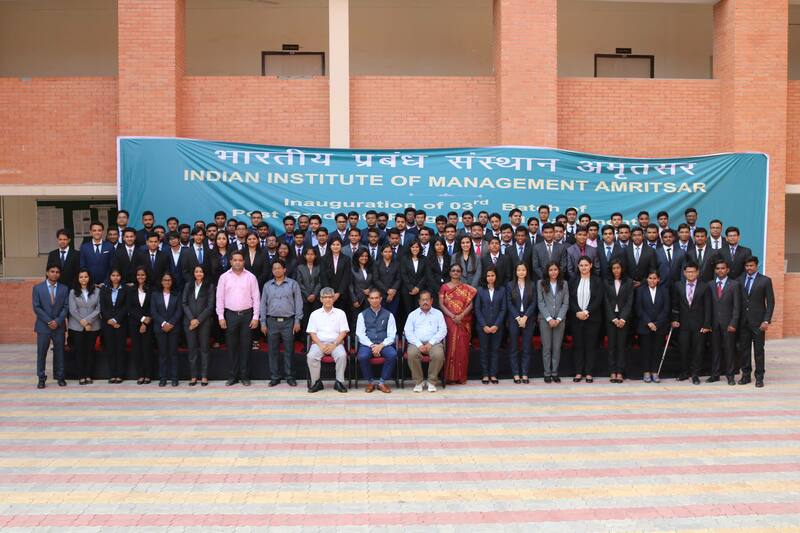 IIM Amritsar earned yet another feather in its cap by the phenomenal conclusion of the second edition of its annual HR Conclave Yukti’17.